Rabbi Yitzhak Shapira, head of the settler yeshiva Od Yosef Chai in the settlement of Yitzhar, has published a book entitled The King's Torah: Laws of Life and Death between Jews and the Nations. The book takes Biblical stories about war and statements from various Jewish legal codes and applies them to today’s Zionist state. The book aroused much media attention, beginning with a front-page headline in the Israeli newspaper Ma'ariv (Monday, November 9). The timing of the book's publication might also have something to do with the extensive media exposure it received. Distribution of the books came just over a week after it became known that Ya'acov Teitel, a settler from Shvut Rahel, had been arrested for allegedly murdering two Palestinians and severely wounding a Christian who belongs to a messianic Jewish community in Ariel. At Mercaz Harav Yeshiva, the flagship educational institution of Orthodox Zionism, there was a small sign in the entrance advertising the sale of the book. Those interested in buying the book were asked to place money in a small cup and take one. But the books were gone. Perhaps this popularity is due to the connections between the authors of the book and Mercaz Harav. The author, Yitzhak Shapira, a student of the eclectic Chabad Rabbi Yitzhak Ginzberg, studied at Mercaz Harav's high school and spent time at the yeshiva as an older student. Rabbi Yosef Elitzur, the other author of the book, is the son of Rabbi Michael Hershkovitz, a teacher at Mercaz Harav. However, it could be that the sudden dearth of copies of Torat Hamelech is for another reason altogether. A librarian at Mercaz Harav said this week that the new book would not be included in the yeshiva's collection. Apparently, Rabbi Ya'acov Shapira, head of Mercaz Harav (no relation to Yitzhak Shapira), does not approve of the book. It is possible that Mercaz Harav's head ordered that the books not be sold in the yeshiva. True, the book has received the approbation of Kiryat Arba-Hebron Chief Rabbi Dov Lior, Rabbi Ya'acov Yosef, the son of Shas mentor Rabbi Ovadia Yosef, and Ginzberg. However, these rabbis do not represent the mainstream consensus of religious Zionism. Copies were being distributed on Tuesday, Nov. 10 at the Yeshiva of the Jewish Idea in Jerusalem, which follows the philosophy of the late Rabbi Meir Kahane. The response of one leading religious Zionist media figure - which perhaps captures best the more right-wing elements within the religious Zionist mainstream - was dread. "I grabbed my head when I saw the headline in Ma'ariv," said the media source who went to school with one of the authors of the book. "I said to myself we have just managed to contain the media damage done to us by Teitel, by showing he is an isolated element, and now this happens. Meanwhile, a prominent rabbi of the Iranian Jewish community has urged his congregation to burn 'The King's Torah'. Rabbi Golestaninejad said that the book's message directly contradicted the teachings of Moses. ”Anyone who utters anything in opposition to the faith, and then goes on to falsely attribute it to the Torah, Mishnah, Talmud or Halakha deserves punishment and chastisement,” he said, adding that the ideas in the book are absolutely false. Jews are followers of Moses. Hence, they do not adhere to Zionism and the ideas of Theodor Herzl, the father of modern political Zionism, the rabbi said. Rabbi Golestaninejad condemned the publication of 'The King's Torah' and called on all Jews to burn the book which he said propagates non-religious ideas. Just as the Zionists use the Jewish people to advance their agenda, the religious among them have taken the Torah, Talmud and other texts sacred to Judaism and desecrated them by applying them to their state. All laws written in the Jewish texts and codes regarding war applied only in the times of the Temple, when the Jews were permitted to have a state of their own. Today, however, we are in exile and we are forbidden to wage any kind of war. We are commanded to live peacefully under gentile governments and follow their laws. 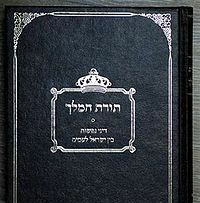 Furthermore, the gentiles mentioned in the Bible and Talmud were murderous idol worshippers, whereas our gentile neighbors today are civilized and believe in the one G-d.
We are angered that the Zionists dare to use the Torah and Talmud to justify their ideology, and we concur with the ruling that this book should be burnt. What all these incidents have in common is that they took place in the time of the prophets, and every act of war was done by direct command from G-d. Simeon and Levi were men of great Divine inspiration. Samuel was a prophet and David, author of the Psalms, consulted with the G-d via the Urim Vetumim on the priestly breastplate before every war he undertook. The Zionists do not have prophets and they do not consult with G-d. In fact, their entire state is contrary to G-d’s command that the Jews remain in exile and at peace with all nations. The fact that there are so-called rabbis who take verses of the Torah out of context and apply them to Zionism is almost unbelievable to us. Where is all their scholarship? We can only remember that such a phenomenon has existed in every Jewish heresy of the past. There were also scholars in these movements who attempted to support them with quotations taken out of context. In the Middle Ages, there were Christians who studied the Jewish books and found support for their religion. There were Torah scholars who wrote books supporting the false messiah Shabbesai Zvi, and the founder of Reform Judaism was a Torah scholar named Mendelssohn. In the time of the First Temple, there were false prophets who claimed that G-d had spoken to them and told them to resist the Babylonians – which is what the people wanted to hear. Our movement attempts to provide Jews with texts and information so that they can sort out the truth from the falsehoods spread by rabbis such as these. The Torah does place a high priority on life, both Jewish and non-Jewish. However, the Torah also gives a person the right to kill in self defense any attacker who is coming to kill him, Jew or non-Jew. This law is written in Exodus 22:1. The settlers feel they have the right to kill Arabs because they suspect every Arab of wanting to kill them. This is, of course, ridiculous, but this is the ingrained hatred and mistrust with which these settlers were raised and indoctrinated. Furthermore, the settlers are wrong to apply “self-defense” to the Israeli-Palestinian conflict, in which the Palestinians, even those who do kill Jews, are not interested in killing Jews for its own sake; what they want is their rights to Palestine restored. The settlers settle the West Bank, often stealing land, making it harder for the Palestinians to regain their land. Is a Jew allowed to steal and then, when the victims come after him, kill them in “self-defense”? Clearly this is not defense of Jewish life, but rather defense of their own criminal acts. If they were really interested in preserving their own lives, the settlers would not be living there in the first place. The settlers will argue that they are not stealing land because the Torah says the land belongs to the Jews. But again this is a misreading of the Torah. The Torah says the land was given to the Jews in the time of Moses and Joshua. But the Torah also says that because of our sins, G-d will take it away from us and send us into exile. Jews have currently been in exile for about 2000 years, and the exile can only end when G-d sends us the messiah; until then, we have no inherent rights to Palestine at all.